Drape's Takes: OpenPD - We've Come A Long Way, Baby! OpenPD - We've Come A Long Way, Baby! As a result, conversation was engaging, educational, and very refreshing. 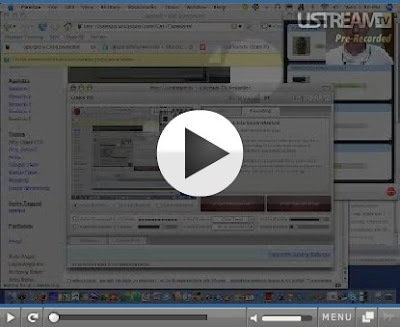 Throughout the night, nearly 60 participants joined in on the action - with Ustream numbers hovering around 35-40 throughout - as we discussed several issues related to the inclusion of social software in one's curriculum and instruction. Click here to see for yourself. Ustream worked great. Audio and video quality was surprisingly good. The 9-person Skype limit is still a pain. Without moving to an Elluminate-type virtual classroom setting, what else is out there that compares? The quality of Skype is amazing. It would be nice to have more quantity. Meebo was nice. Or was it? Kicking out the occasional sexbot was interesting (just like high school - lol), but here's a huge bummer: We couldn't save the chat. Perhaps if I create a room associated with a Meebo account? I haven't been able to play with it enough to know the best scenario but will find a solution before our next session. And yes, I love the fact that you can participate in the chat without creating an account. See our "Get Connected" page to experience it first-hand. Robin stays pretty busy managing the Skype call while teaching. It would also be nice to have a person in the call that focuses on the chat conversation. You know, someone that could verbalize what was written in the chatroom. I think that would help every participant feel more involved. Any volunteers? I need to do a better job at switching the camera. You know, get the camera off of me while Robin is teaching. It's well documented that I'm an excellent multi-tasker so I'm not too worried about getting this done (pledging to do my best). If we can't archive the chat (or chose not to), it would also be very helpful to have someone record the links that are shared. After all, that's the best part about archived chat. Any volunteers? Anyway, a huge thanks to all that joined us last night. This has been an exciting adventure and I look forward to next week's class! Blogging: Just Another One of Those "Dangers"